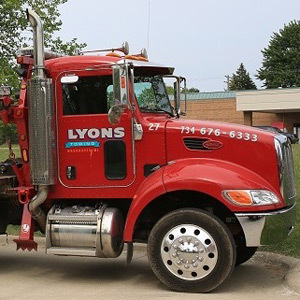 For over fifty years, Lyons Towing has served as the premier towing company in Southeast Michigan. As a family-run operation, we bring a level of individual care and customized service to our customers not found in other towing companies. Call us for all your light duty towing and heavy duty towing needs. There is nothing worse than being stuck on the side of the road with car trouble. When you need a tow, don’t call just any towing company in Southeast Michigan. Since 1960, Lyons Towing has served the greater Southeast Michigan area, bringing convenient and reliable towing services to all our light duty towing and heavy duty towing customers. As a family-run business, we appreciate the value of honest relationships and fair dealing. Endeavoring always to serve our clients at the highest level, we provide efficient, quality service at a price you can afford. No matter what time of day, rest assured you can call us for help. We provide convenient and reliable heavy duty towing and light duty towing. We can perform recovery and transports. We are family-owned and run, focusing always on customer satisfaction. We bring decades of experience and expertise to the industry. Whenever you need light duty towing or heavy duty towing, there is no better name to call than Lyons Towing.